Initiated by West Heavens, Yiwu Project focuses on the business migrants community from various regions of India in Yiwu（义乌）in Southeast China, the centre for production and sales of globally ubiquitous low-cost goods and objects. Two and a half hours on the train from Shanghai, Yiwu has a history of more than 2,400 years, but it is now known as the world centre of small commodities. Since the 1980s, it has been famous for producing garments, accessories, zippers, prints, toys and craft gifts for the global market. In 2012, more than 1,500 Indian merchants are based in Yiwu and more than 30,000 Indian businessmen visit the city. We hope the documentary facilitates a greater understanding of the reciprocal positions in the flux of globalization between Indians and Chinese, each tangled within their own and very different political and economic systems, by witnessing and exploring the encounters of businessmen in Yiwu through the lens of these two diverse cultures. This documentary-based research project aims to observe and understand this unique global centre as seen through the lens of a filmmaker from India. *This project is initiated and curated by Prof Lu Xinghua (Tongji University, Shanghai) and Prof Lu invited the Raqs Media Collective from New Delhi to act as the project’s advisors. 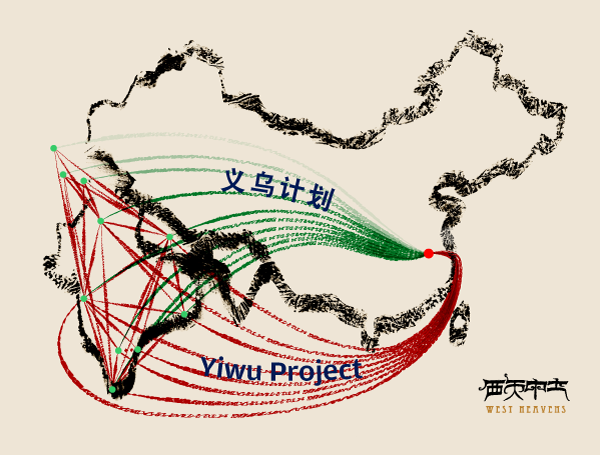 The Yiwu project’s call for participants received a considerable number of proposals. Prof Lu Xinghua and Raqs Media Collective decided to invite journalist and filmmaker duo – Aman Sethi and Iram Ghufran – to join this project. Also, there seems to be a kind of historic reversal in operation in India of the ‘west heavens’ imperative in the Chinese tradition. This is the ‘go to china’ imperative, which several traders and small manufacturers have told Aman and Iram. What does this mean for a new ethic of exchange and encounter? The proposal offers the possibility of a film as well as a piece of long form journalism that will be in tandem with each other. Finally, the filmmaker and the journalist are both very accomplished, and we think that they are seriously committed to producing something of quality, that challenges both their own thinking and also makes a worthwhile contribution to the dialogue that West Heavens has initiated.